I appreciate this opportunity to talk about my experience at the Sky Lake Think Tank. I heard different iterations of this gathering’s inception, but from the beginning it seemed like the team continued to evolve its sense of mission based on the relational dynamics that were arising. 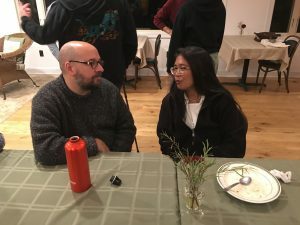 From what I understood, the original motivation for the gathering was to bring folks together who were already engaged in social activism and movements, whether in the Shambhala community or outside of it. 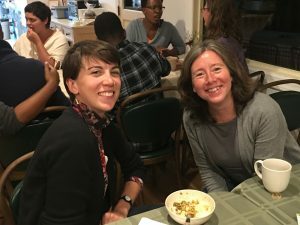 There was inspiration to gather collective wisdom and help prototype potential actions for the Shambhala community to be more socially engaged and aware. I came in curious to dive into important conversations: “What are you working on?” “How can we work together?” But I didn’t entirely know what the objective was for gathering. After seeing the list of participants, which was the most diverse group of leaders that I had ever seen in Shambhala, I felt almost overwhelmed by how many conversations I wanted to have, hear, and soak in. It felt powerful knowing that the hosting team had pushed to invite new team members over the course of this program’s design process, in order to center voices that have been largely unsupported in leadership and teaching, like women of color and queer folks. Over the course of our time together, there was a lot of feeling into the space, getting to know each other’s deep work and desires for helping Shambhala and the world around us wake up to societal suffering and the roots of certain kinds of suffering. Being such a diverse group of participants, there was an incredible awareness on the design team of how societal patterns show up in group conversations and social dynamics. I felt that they took important steps to focus directly on the relational aspect of our time together. What is actually showing up in this room right now? Are there people who feel unheard, or unsafe? Are there people who feel more comfortable and supported in the Shambhala environment, and others who do not? The pivotal moment for me was when the people of color requested time and space to be together, and the Latin Americans joined them. The request felt so clear to me, energetically, even from the beginning of the weekend. In Boston we have had a POC group for the last year, led by two people who also participated in the think tank. Through conversations with those leaders, I know that supporting spaces where people of color can connect, practice, and have conversations across their experiences is both extremely rare and incredibly nourishing. We have been working with this notion of caucusing for about a year at our Center, including a group for white folks to come together to discuss and learn about power and privilege, from a place that is both gentle and compassionate but also challenging and powerful. Caucusing is not entirely an end in itself, but a meaningful way for groups of people who have differing experiences of their bodies, their identities, and the way they are either ‘othered’ or ‘centered’ to be able to express confusion, vent, grieve, and look closely together at the experiences that we might share with one another. I have facilitated a few white people groups. In those processes, I almost never know what success looks like. They are often messy, scary, and intensely exposing. I have been trained over my whole life to not talk about, look at, or express anything about race. Don’t point out differences, don’t feel it or acknowledge it. I have found in this experience of caucusing that hearing other white people’s confusion, pain, and fumbling has given me permission to not know the answers, to not be a ‘good white person.’ To have these conversations with just white people changes the dynamic of relying on POC people to point out our blind spots, educate us, and continue to do the heavy emotional and intellectual labor of changing a power dynamic that they are continually at odds with. As a white person I take seriously the responsibility of actively engaging in this work of dismantling confusion around race, doing it in a way that supports POC instead of exploiting them. What happened at the think tank in terms of caucusing was very important. To my knowledge, and speaking with other leaders at the gathering, there has never been a gathering with so much diversity in a Shambhala context. To me, the request and decision for the POC group to have space to be together, felt like a deep acknowledgement that in order to re-pattern who feels welcome in our spaces, we must listen to and trust those who have not felt safe in Shambhala spaces for a long time. Much of our forms, language, and spaces have been formed from a white perspective (being a predominately white leadership and participant community), so the experience of whiteness is usually what operates at the center of a retreat experience or practice space. To be at the think tank where the team and participants wanted to actually flip that dynamic and say, ‘We’re going to intentionally put the people of color at the center of the decisions we’re making this weekend,’ was a monumental narrative shift. Being a part of the white group felt like a familiar kind of confusion and groundlessness. As a friend and colleague of people in the POC group, I felt a sense of separation sitting in the white people group, hearing the laughter and joy of the POC group in the main shrine room. Of course, a part of me wants to hear their stories, witness their suffering, and hold their words in a way that informs my decisions and actions as a white person. I want to link arms with my friends and figure out a way forward that feels cohesive and shared. But the reality is, that kind of shared work and conversation around race takes time, separate caucusing work, and most of all, building relationships. Where I have begun building relationships is with myself and how I grapple with being identified as a white person. Understanding that it is not my white person-ness that is a problem, it is that I have been brought up in this strange system of checks and balances that weighs my body’s worth against others. And everyday I gain access to places, conversations, wealth, and an ease in the world that I did not ask for but still benefit from. Being able to uncover these benefits and subtle systems of outweighing others’ worth is a process that is painful beyond words. And for a group of white people who were new to having these conversations with each other on a relational level, of course, there was a lot of trying to control or fix each other’s experiences. The white people group felt clunky, challenging, and uncomfortable. For all of the discomfort of stumbling through conversations with fellow white participants about racial dynamics in the think tank, I came to an important conclusion for myself. I knew that every single person in the POC group had had the experience of being the only person like them in perhaps an assembly of 200 people, or a class or group or gathering in Shambhala. And in those experiences, I’ve been told, they often didn’t have support, and more often were identified over and over again as being the only POC in the space in a way that was further exposing and alienating. So the fact that we as a group of white people were feeling a little isolated, even when we were in an entire group of people to talk about the experience, I think illustrates the privilege we wield in our community. If we want to change our understanding of who feels invited in and who feels left out, as white people we could spend more time being left out, holding that feeling with utter compassion and kindness. Editor’s note–the next story in this series will also be a personal narrative from a Think Tank participant: Alexandria Barnes, Assistant to the Director of the Office of Social Engagement. Readers who missed the first two in the series can find them here: https://shambhalatimes.org/2017/11/14/think-tank-four-voices/ and https://shambhalatimes.org/2017/11/16/think-tank-one-of-many-voices/. The Shambhala Think Tank on Social Engagement was made possible with support from the Sakyong Foundation, the Shambhala People of Color Scholarship Fund, donations to a travel fund on the Offering Bowl, and in partnership with Sky Lake. Thanks for your insight, Ashley. A big ‘yes’ to all that you’ve shared. Very well put, Ashley. It helps others to understand everything you struggle with, and invites us to struggle as well.